On the train into Waterloo yesterday morning I was reading a very funny piece in the Guardian by Hadley Freeman about how she was the only female reporter assigned to cover the Football World Cup in Brazil. Hadley used to write about fashion and she drew a parallel between fashion and sports writers, an unlikely alliance if ever there was one. “They have managed to wangle a career out of something they quite liked as teenagers,” she wrote, before adding that the same applied to music and film hacks. And what a lucky bunch we are, I thought last night as I listened to my old friend Pete Frame open an exhibition of his now famous Rock Family Trees at the Barbican Library in London. In a witty and self-depreciating speech Pete left no one in any doubt that he’d been lucky in the life he’d created for himself, making a living out of something he quite liked as a teenager, though in his case I’d substitute ‘besotted with’ for ‘quite liked’. Pete and I go back a long way. Believe it or not we met, in November 1973, at the home of Linda Ronstadt in the hills beneath the Hollywood sign that overlooks Los Angeles. For some reason Linda’s PR had scheduled us to interview her together and as we did so Emmy Lou Harris, then largely unknown, sat quietly in a corner working on a crochet. Pete and I circled one another warily. Melody Maker was a big circulation weekly, the rock paper equivalent of a major label, while Zig Zag, the monthly magazine that Pete had founded with his great friend John Tobler, was like an indie label. Pete mentioned this last night as he took his rapt audience through a resume of his life, beginning with hearing Bill Haley sing ‘Rock Around The Clock’, running through some of his many interview encounters and ending up in the Highlands of Scotland where he now lives. It was clear to everyone there that he wasn’t cut out to be an insurance clerk, his first job, that his love of rock’n’roll supplanted everything else that he ever came across and shaped him every which way. He’d brought along one of his first R&R scrapbooks – be began making notes at an early age – and, just as Hadley Freeman suggested, was certainly adept at wangling when it came to edging his way into the music industry. The first interview he ever did was with Christine Perfect, later McVie, then with Chicken Shack, in the back room of a pub in Wood Green. His first family tree was on Al Kooper, the keyboard wizard whose Hammond organ on ‘Like A Rolling Stone’ Dylan likened to ‘the sound of wild mercury’. He had us all in stitches when he revealed that when researching his Black Sabbath Family Tree he couldn’t find out the name of the drummer of Ozzie’s first band so slipped in the name of the landlord of his local instead. After his speech Pete, for whom the word avuncular might well have been coined, did a Q&A and I’m pretty sure he and his audience could happily have listened to him reminisce long into the night. He is, of course, one of rock’s truly great archivists and that archive will soon be finding its way into the Glasgow Public Library. 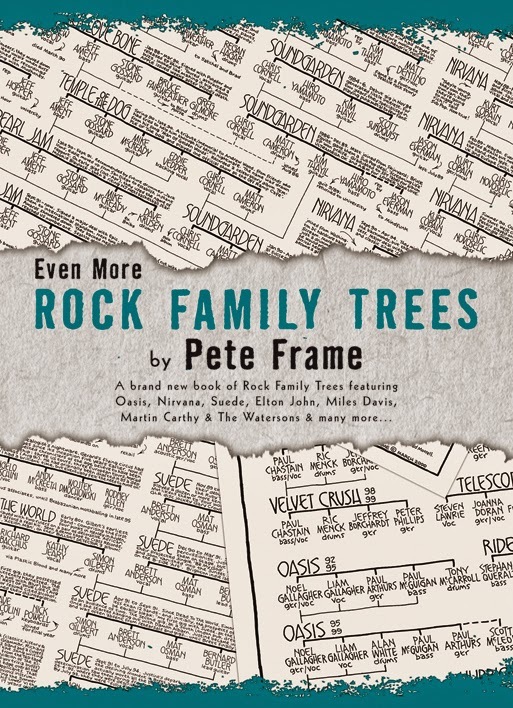 Omnibus Press is proud to be the publisher of his compilations of Family Trees, five in all with two of them combined into one bumper book, and in a way I’m his editor though you can’t edit Pete any more than you can get backstage to chat with the stars at big rock concerts these days. In our day you… well, that’s what Just Backdated is all about so I won’t go into it here but I can’t resist mentioning in closing that I’m probably one of the few individuals who’ve commissioned Pete to do a personal tree, the Charlesworth line going back to our great grandparents as a gift for my sister Anne on her 60th birthday. Thanks again for that Pete. Get 5 Star verified winning picks on NFL, NBA, MLB & NHL + Anti-Vegas Smart Money Signals!!! ROBERT PLANT - Part 1 of 3 part Interview. JUST BACKDATED - Statistical Milestone Reached!